One of the book clubs that I am a member of has as the current book choice James Joyce’s Ulysses. Deep breath. Neill Smith says on the BBC’s website “the book has fascinated scholars and baffled readers for decades with its dense prose, obscure puns and allusions to the characters and events of Homer’s epic Greek poem The Odyssey.” Deeper breath. I have being putting off diving into Joyce’s major opus and decided instead to go to a reading from Ulysses, in Sweny’s pharmacy on Lincoln Place in Dublin’s city centre. Sweny’s is the chemist shop where the epic’s hero Leopold Bloom buys a bar of lemon soap on his odyssey around Dublin on the 16th June 1904. 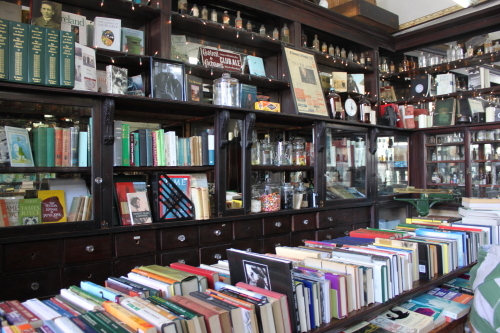 The interior of the shop remains the same as it was in Joyce’s day. Sweeny’s is no longer a pharmacy but has been taken over by a dedicated band of volunteers who organize readings from Joyce’s works. 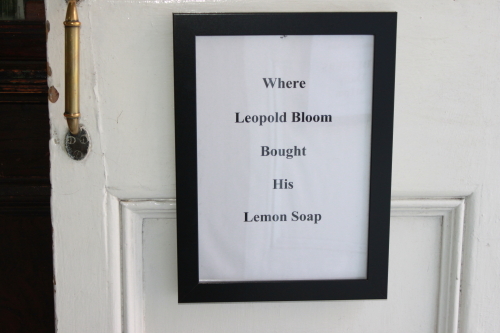 You can still buy the soap described by Bloom as ‘the sweet lemon wax’ and there are also books and other items on sale. The excellent reading whetted my appetite; I have started the novel but have a very long way to go. Wish me luck. Note; There are readings from Ulysses in Sweny’s on Thursday at 7pm and Saturday at 11am. Readings from Joyce’s other works are held between 1 and 2pm from Monday to Friday. Donations towards the running costs of Sweny’s are requested after the readings. The shop is open from 11am to 5pm Monday to Saturday. Thanks for that Tom I will check it out. I went to a reading there once, and it ran so late that I was clandestinely texting my friends to tell them I couldn’t make dinner (I was afraid that they’d be waiting about!). A lady gave out to me for distracting her so I wandered off in a snot and never went back. Oh, that’s a shame. Hopefully you will go back. I enjoyed the reading I went to but I have to confess I never finished Ulysses; I did mange the first four or five chapters. Maybe some day I will try again.